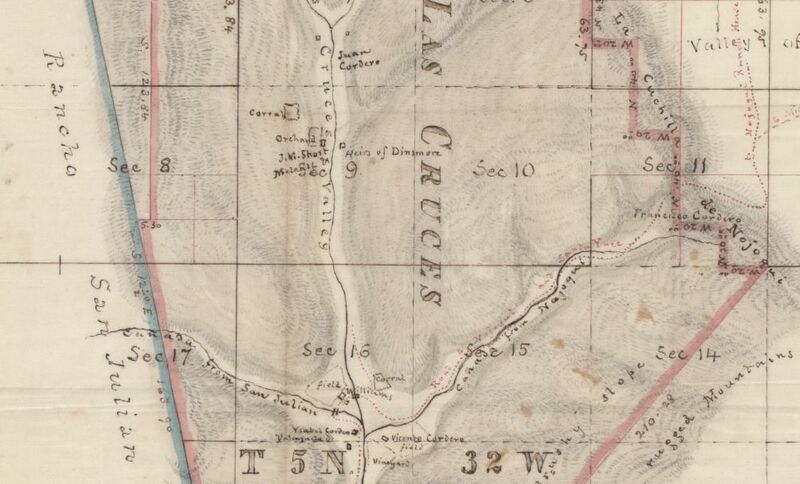 Below is a portion of the Diseño for Rancho Las Cruces that was made in the late 1870s for several Cordero families who submitted a petition to Congress that would allow them to have the land claim recognized by the United States well after the deadline. A few years later in 1880, only a few families remained at Rancho Las Cruces, including some of the following Cordero families identified in the diseño. 1. Juan de Jesus Cordero and Antonia Valenzuela (top left). Juan de Jesus Cordero was the son of Mariano Cordero and Juan Pinto. Juan and Antonia had moved to the city of Santa Barbara before 1870. Juan died in 1876, and in 1880 Antonia lived with her son and daughter-in-law, Juan de Jesus Antonio and Guadalupe Ayala Valenzuela. 2. Estanislao Cipriano Cordero and Maria de la Luz Olivera (top left). Estanislao was the son of Juan de Jesus Cordero and Antonia Valenzuela. Estanislao Cordero and Maria Olivera resided at Las Cruces in 1880 along with five children. 3. Francisco Narciso Cordero and Rafaela Leyva (deceased) (middle right). Francisco Narciso was the son of Juan de Jesus Antonio and Guadalupe Ayala Valenzuela. Francisco and three children lived at his home at the edge of the Las Cruces rancho near Rancho Nojoqui. 4. Vicente Cordero and Antonia Espinosa (bottom). Vicente and his second wife, Antonia Espinosa, lived in the adobe that he built adjacent to the original adobe built by Miguel Cordero. The adobe house of Vicente Cordero pictured in the postcard is on the far left. 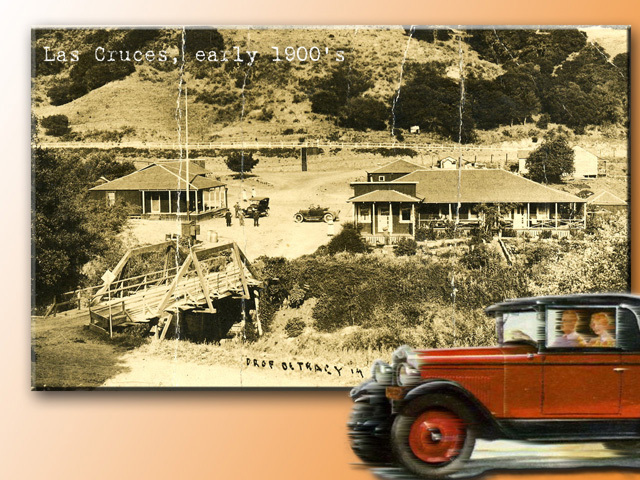 The bridge was originally from the Gaviota Pass, just south of Rancho Las Cruces. 5. Isabel Cordero and Clodoveo Valenzuela (bottom). Isabel Cordero was the daughter of Miguel Cordero and Antonia Jimenez. Clodoveo and his son, Eugenio, lived at Rancho Las Cruces in 1880. 6. "Codero" below"Y Valenzuela" (bottom) was most likely the former home of Maria Trinidad Cordero and Francisco Guevara. Trinidad Cordero was the daughter of Vicente Cordero and Antonia Espinosa. Trinidad and Francisco lived with their four children at Racho Las Cruces in 1880. 7. 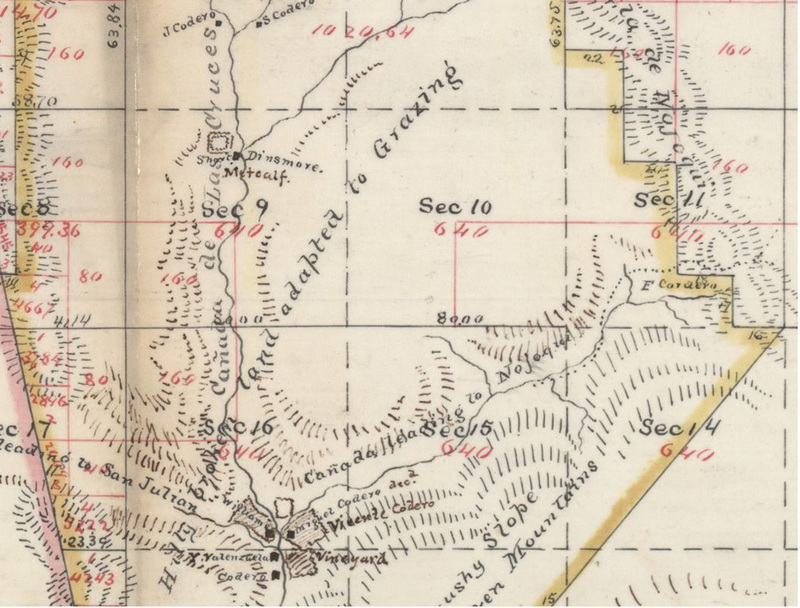 Alfredo Cordero (son of Estanislao Cordero and Cirilia Ruiz) and Demecio Cordero (son of Gregorio Cordero and Rita Garcia) worked at nearby ranches in the Las Cruces Precinct in 1880.